What kind of shape is your roof in? Will you be ready for the next rainstorm? If the time has come to replace your roof you can either take this on as a do it yourself project or hire a professional. Most homeowners opt for the professional choice because they don’t want to mess around with something so vital for their home. Before you pick your roofing contractor you need to do a little homework. First, you want to check all of their licenses. Are they certified to do business in the state? A good way to find out how professional they are is to ask for their tax ID number and business address. You should also check their insurance policy. Don’t just take their word for it. Ask for a copy. If they have a problem providing you with a copy of any of that information then they aren’t the roofers for you. You also want to get a sense of the job as in how many workers will be showing up at your place and how disruptive will the project be for your neighbors. Often, those roof shingles can fly off fast and land all over the place. The workers should clean up at the end of the day but they might need to take extra care with a neighbor’s car that might be parked right next door. You might be better off giving your neighbor a little warning and maybe they can move their car for the day. Obviously, you’ll want to look for a good price but that doesn’t mean you should be cutting corners especially when it comes to getting rid of all those old tiles and leftover roofing materials. Instead of being charged a hefty fee by your contractor, you can turn the removal side of the project to Junk King Stockton. These are the local junk removal professionals who won’t have a problem cleaning up after your roofing project. Even though Junk King is known for things like furniture and appliance removal, many homeowners have tapped them to help with remodel clean up. 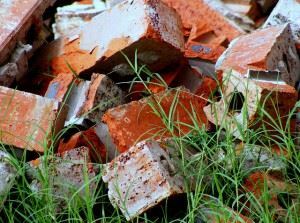 Not only can they get rid of roofing but they can also pick up and discard bricks, concrete, dirt, lumber, siding and drywall. Basically, anything you need to throw out because of a demolition or build project Junk King stockton can handle. They’ll send over the manpower and the big truck to get the job done. Let your roofers focus on the roof and let Junk King handle all the trash. This entry was posted in concrete disposal stockton ca, Stockton Dirt Removal, Stockton Junk Removal and tagged brick disposal stockton, concrete disposal stockton ca, roofing disposal stockton on October 21, 2013 by Carlos Duenas. Last updated August 2, 2017 .